Use these centerpiece ideas as inspiration for your next Halloween party or as festive additions to your home to add some fright to your holiday table . Miniature jack-o'-lanterns make a big impact when arranged on footed cake stands and displayed on a vintage tray. 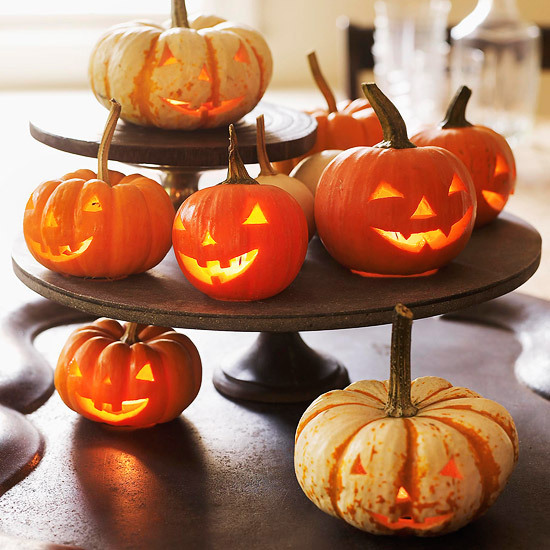 Place battery-powered candles inside each hand-carved pumpkin, and let your guests enjoy the glow. 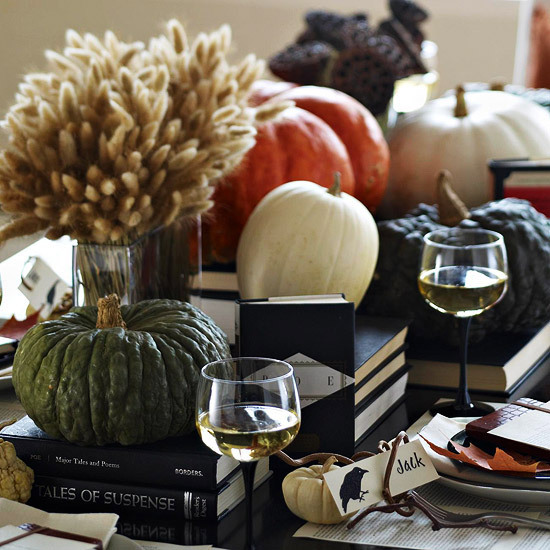 Books, pumpkins, and gourds compose this Edgar Allen Poe-worthy Halloween centerpiece. Use black books, or craft quick book covers with black construction paper. Editor's Tip: Incorporating raven accents on items such as place cards will make the spooky Edgar Allen Poe vibe even more apparent. 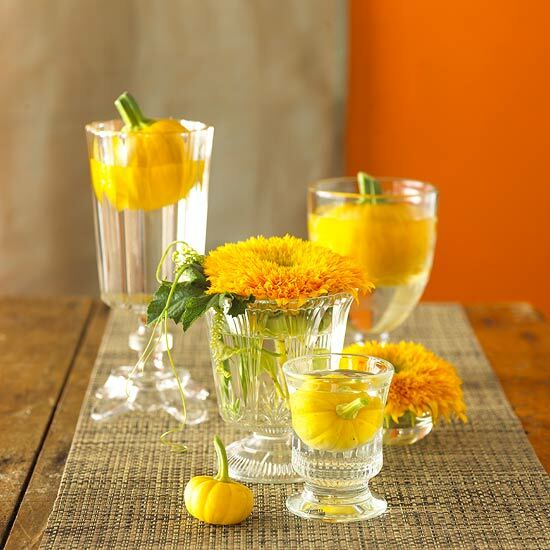 This centerpiece with pumpkins and flower glasses plays a trick on the eyes, as miniature pumpkins placed in water-filled glasses appear to float in the water. (Spoiler: They're just too big to sink all the way to the bottom.) Bright orange flowers resting in a glass and small, shallow bowl add more orange to this Halloween centerpiece. Editor's Tip: To add more color, replace water with black and orange candies or smooth black stones. These tall glass votive holders -- complete with a black jelly bean base -- hold black and orange candles. 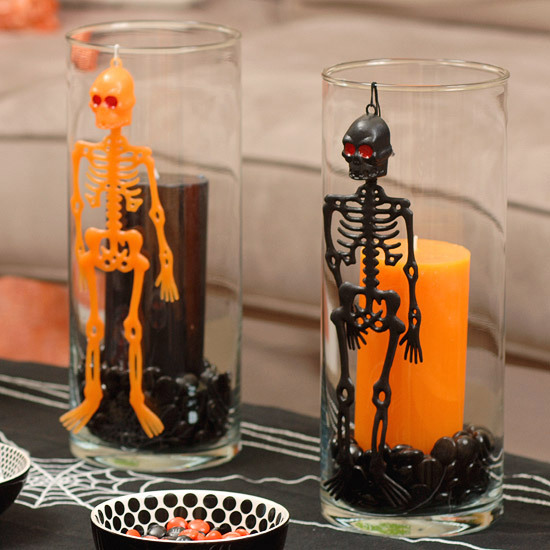 Spooky skeletons hang on the outside of the votive holders, ensuring an extra-haunting glow when the candles are lit. 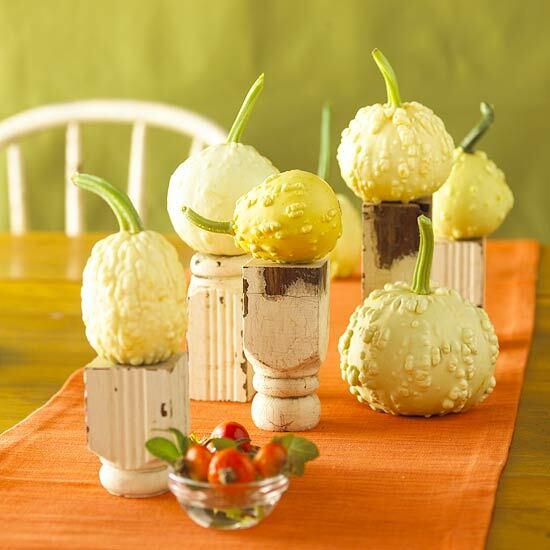 Use rugged old cabinet legs as eye-catching bases in this Halloween gourd display. 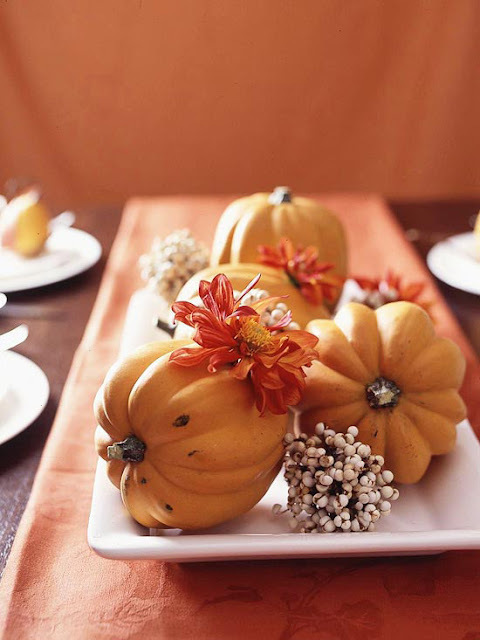 Elevating some gourds and leaving others on the table, as well as varying the size of gourds, adds quirkiness to this Halloween centerpiece. Editor's Tip: Tie ribbon onto the bases in knots or bows to add quick bursts of color. 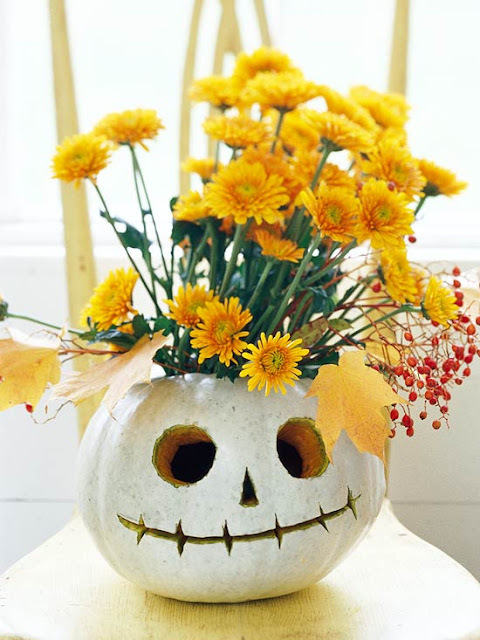 A smiling jack-o'-lantern becomes the perfect Halloween vase when you place a container of water and flowers inside. A simple carving (or scraping) that forgoes the typical wide mouth will help the inside container stay hidden. Use a white pumpkin and orange flowers for extra pop. 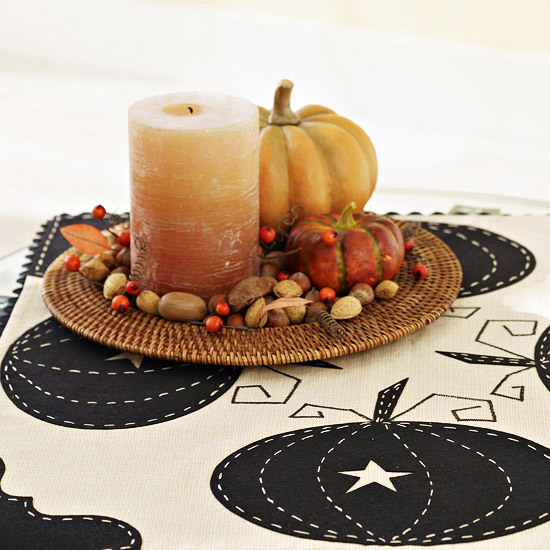 Nuts, pumpkins, and a large candle dress up a small woven mat in this simple-yet-sophisticated Halloween centerpiece. Fallen leaves tucked into the display add natural fall flair to the decoration. Editor's Tip: For a more kid-friendly decoration, use candies, painted pumpkins, and a battery-powered candle so curious fingers don't find a flame. 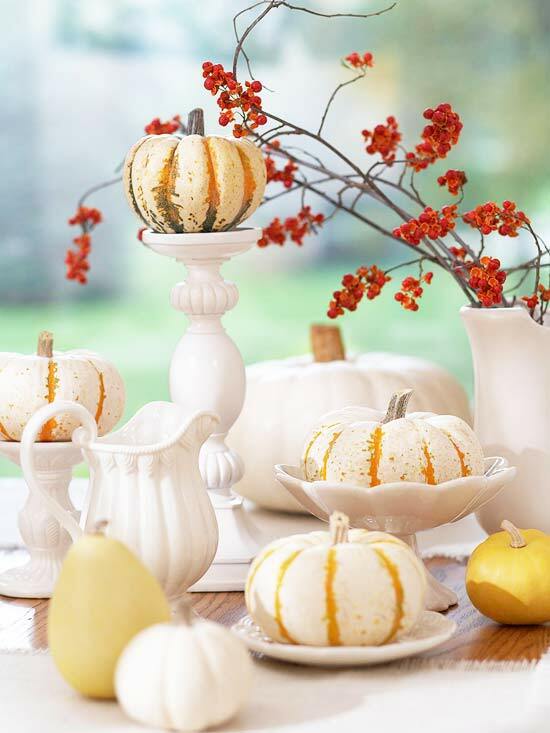 Simple white dishes display multicolor pumpkins in this elegant Halloween centerpiece. Use footed bowls, small plates, and candlesticks at varying heights to create an eye-catching display. 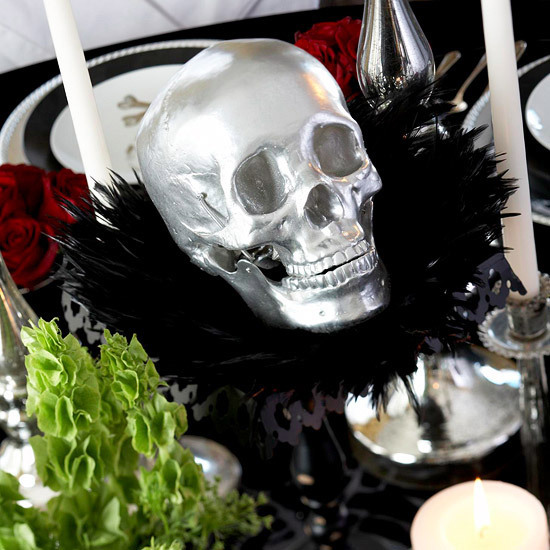 For a centerpiece with both spook and glam, spray-paint a plastic skull silver. Use black feathers to create a to-die-for boa around the "head of the table." Place the skull on a black raised stand or footed dish for a lively Halloween decoration. A plain white platter becomes a Halloween centerpiece with a handful of scattered miniature pumpkins and fall accents. The nonlinear look is key with this decoration, so assemble pieces randomly along the platter for an effortless, relaxed look. 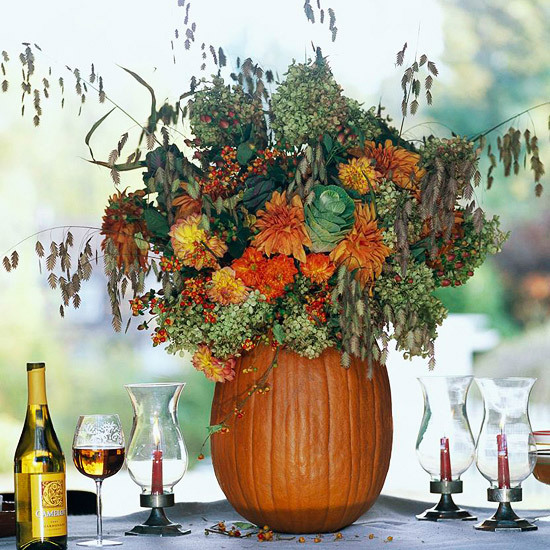 Use a large, tall pumpkin to create this picturesque Halloween centerpiece. Stuff a variety of flowers, fillers, and greenery in a vase inside this simple, hollowed-out pumpkin. Editor's Tip: To add a bit of festive fun, tuck tiny Halloween decorations, such as plastic spiders or spooky stir sticks, into the arrangement. White pumpkins double as vases and make for a spook-free Halloween centerpiece. 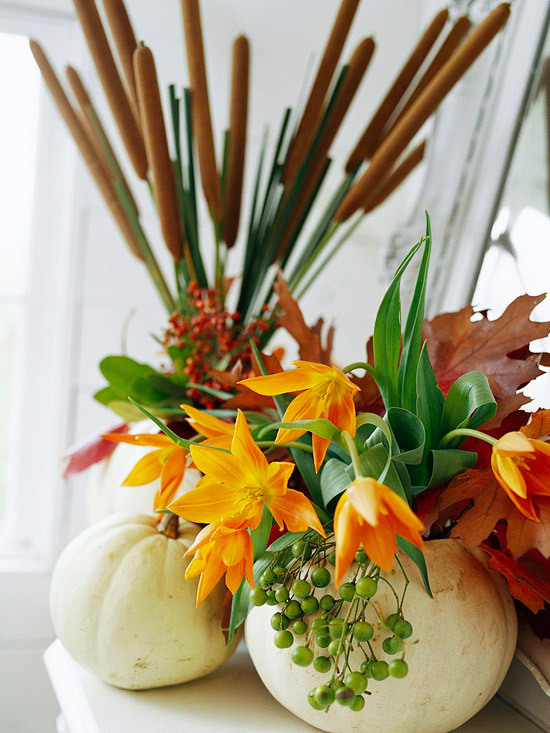 Leaves, orange flowers, and cattails are tucked into a hidden vase or container in the hollowed-out pumpkins.